The phrase “Localised Decision Making” immediately conjures up images of council meetings where a group of people make decisions that will affect those in the immediate vicinity. The dictionary definition goes something like this: – ‘An administrative body for a small geographic area, such as a city, town or county’. We can equate this to industrial automation in a modern process plant where the PLC represents the national government but it doesn’t necessarily need to be involved in localised decisions. For example, zero pressure conveyors are widely used in industry to protect packaged goods from being damaged by packages backing-up in the event of a conveyor jam. The sensing logic in this type of application doesn’t necessarily need PLC involvement and could be employed locally to the conveyor. It can also be expanded as required, without the need for PLC re-programming. Demonstrating their commitment to flexible, custom solutions, Turck has developed the next major step in industrial control: the field logic controller (FLC). FLC solutions are made possible by ARGEE, a revolutionary programming environment that allows users to set conditions and actions directly at the field level. By utilising HTML5, Turck provides a complete engineering environment for users to write, run, simulate, debug, and monitor code, all without the need for a PLC. Using a simple “Condition” and “Action” principle that is integrated into a flow chart user interface, ARGEE allows users with little or no experience to configure and programme FLC devices to carry out tasks that fieldbus devices have never been able to do before. This simplified, straightforward approach allows programming at the fieldbus level, eliminating the need for a PLC in some stand-alone applications, while still allowing the device to communicate with a PLC as necessary. Using FLC’s, Turck’s multiprotocol block I/O devices can act as simple I/O devices or as stand-alone logic controllers. In short, ARGEE challenges what an I/O device can do by creating a hybrid between simple block I/O and higher level PLCs. And whilst Turck have been busy bringing their field logic controllers to the market Turck Banner’s other principal, Banner Engineering has also been active developing and releasing their new DXM100 logic controller. The Banner Engineering Sure Cross DXM100 industrial wireless controller is designed to facilitate communications for Ethernet connectivity or Industrial Internet of Things (IIoT) applications. Available with an internal Sure Cross DX80 wireless gateway or a multi-hop data radio, this Modbus communications device reliably connects local wireless networks with the internet or host systems. 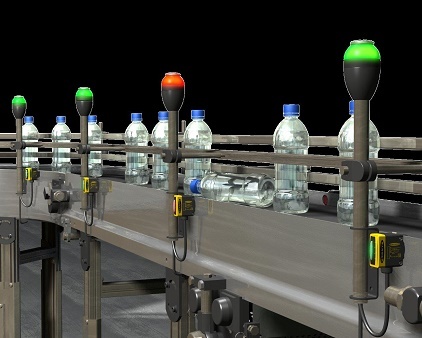 To satisfy multiple application requirements, the DXM100 controller offers several wired and wireless connectivity options to easily share data between local and remote equipment. The cellular modem option eliminates the need for IT infrastructures to connect remote equipment, while the integrated Sure Cross wireless radio version enables Modbus connectivity to equipment. The DXM100 incorporates several automation protocols into its system, including Modbus RTU, Modbus TCP and EtherNet/IP. The controller also features onboard universal and programmable I/O ports for simple connection to local sensors, indicators and control equipment. Designed with an interactive, programmable user interface consisting of an LCD screen and four LED indicators, operators can quickly access system status and set-up, view selected events or data and perform site surveys.